I'm trying to decide why this film is playing at the New York Film Festival. Actually, I'm trying to figure out how anyone could choose to screen this film anywhere. There is nothing in the film that would make me think that any rational person could actually like it since it involves sequence after sequence that makes makes no logical sense on any level. While the NYFF write up describes this as "disarmingly realistic" this is probably the most unbelievable film I've seen all year and I say that after seeing some really WTF films. It is beyond stupid with a series of events from the first frame that tries your patience and sanity. The plot of the film has a TV cameraman, Armin, who can't run a camera ending up as the last an on earth after something happens and leaves him, for a while anyway, all alone. DOA from the opening sequence when he manages not to record the events he was sent out to record by turning off the camera when it should be on, the film then goes through a series of sequences that don't make a great deal of sense on any level. While I was lost to the film with the stupid camera bit, the film lost me as events happened that made no sense. Things as simple as how cars and motorcycles after the disappearance are neatly "crashed" with no signs bent metal made me shake my head. Worst of all Armin never ever questions what happened he just instantly acts as if he knows whats going on. Really? Then there were whole sequences like the gutting of a blind and deaf dog on a jagged piece of glass in a broken door that had me wanting to scream at the screen. It wasn't just the off screen animal cruelty, it was that for it to happen the dog would have had to walk across broken glass (which would later severely cut our hero's feet) and then try to leap over a piece of glass it couldn't see it need to leap over. 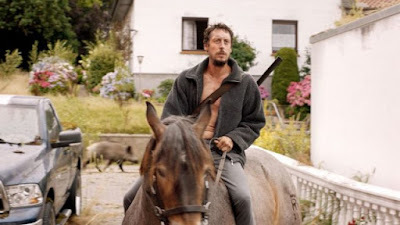 There are time shifts that make no sense as Armin sees the dying dog, then walks next door to where the dog lived with it's owner, a hunter, to get a gun in the early part of the day and returns at night with the gun- where did the day go? Of course Armin's behavior makes no sense as he finds that everyone is gone so, without really looking any where, goes upstairs and tries to kill himself with pills. He wakes up the next morning, cleans himself up then sets the house on fire and drives off...WTF? Nothing makes any sort of sense if you think about any of it. I've read reviews that have liked the film but I can't see anything they talk about in the film. It's supposed to be about being disillusioned and wanting a new life and getting it, but where is the disillusioned bit? Where is the nightlife he is tired of? Its one scene. I'm convinced that anyone who liked the film read some press notes which explained it all for them. Whatever it is that people have responded to positively is not on the screen. Even more messy than the director's film SLEEPING SICKNESS which went off the rails repeatedly, this is a film that probably played best when it was still in the directors head..which is where it should have stayed. IN MY ROOM is not recommended to anyone for any reason except as an example what happens when a film has no internal logic.